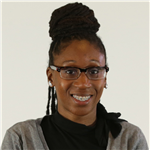 Lachelle Smith joined the University of the District of Columbia Law Library as the Systems Librarian in 2016. Shehas worked as an IT professional in the academic/law school environment for seven years. Lachelle taught Legal Research Course for first-year law students. She is a member of the American Association of Law Libraries and The Law Librarians' Society of Washington, D.C. She has a B.S. in Information Technology and an M. Ed in Educational Technology. She is currently enrolled at Catholic University of America and will receive her M.L.I.S. in Spring 2019.